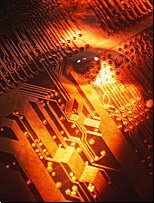 Integral Technologies, Inc. ITKG ("Integral"), announces that Knowles Electronics, LLC. 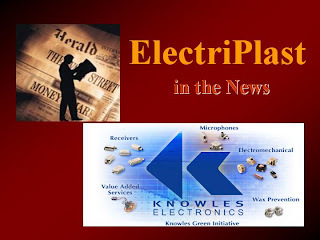 ("Knowles") (www.knowleselectronics.com) has entered into a licensing agreement with Integral and has purchased the Company's proprietary ElectriPlast™ technology for use in their products. Knowles is the world's leading provider of microphones and receivers to the hearing health industry. They are credited with the miniaturization of the acoustic transducer, which has enabled the design and manufacture of smaller hearing aids. Knowles has increased the transducers' sensitivity and maximum output, helping those with even the most profound hearing loss. This order and shipment represents the first commercial order for Integral's ElectriPlast™ technology. Integral's manufacturing agreement with Jasper Rubber provides for faster delivery of the multiple ElectriPlast™ applications. Knowles is making the designs of today a reality and is constantly pushing the limits of technology for tomorrow's products. ElectriPlast™, the world's first highly conductive polymer, was recently selected as a recipient of the Consumer Electronic Show's Innovations 2007 Design and Engineering Award in the Enabling Technologies product category. Integral Technologies continues to work with numerous companies that are exploring over 111 patented and patent pending identified applications of the Company's ElectriPlast™ technology. Integral Technologies, Inc. (www.itkg.net) is the developer of an innovative electrically conductive resin-based material called "ElectriPlast™," a highly conductive recipe that can be molded into virtually any shape or dimension associated with the range of plastics, rubbers and other polymers. Our IP consists of ElectriPlast™ and thousands of different applications pertinent to a wide variety of industries. To date, we have had 24 US patents issued, or allowed and pending issuance, and 87 patents pending on ElectriPlast™ applications. Various examples of industries where ElectriPlast™ can be used are antennas, shielding, lighting, circuitry, switch actuators, resistors, and medical devices, to name just a few. The company is currently introducing these new products and ElectriPlast™ technology on a global scale. This press release contains "forward-looking statements" within the meaning of Section 27A of the 1933 Securities Act and Section 21E of the 1934 Securities Exchange Act. Actual results could differ materially, as the result of such factors as (1) competition in the markets for the products and services sold by the company, (2) the ability of the company to execute its plans, and (3) other factors detailed in the company's public filings with the SEC. By making these forward-looking statements, the Company can give no assurances that the transaction described in this press release will be successfully completed, and undertakes no obligation to update these statements for revisions or changes after the date of this release. Well I suppose we now know who Jasper was making the production run for. As a experienced trader, I have to say that ITKG is really a compelling case. With this news, my confidence level has increased. This is far from the last bit of news to hit the scene. Don't get me wrong, the news associated with this report was outstanding. That said, speculative rumor has it that something meaningful will soon occur. The specifics are hazy at this time, but the underlying sentiment is that this event will further enhance the ElectriPlast IP's marketing ability, and that it will be looked upon with extreme favor by the shareholding readers.